ToodleDo is my recommended task management software for MYN if you cannot use Outlook. If you have read my books, you probably know I believe strongly in converting e-mails to tasks. Doing that is THE way to get control of an out-of-control in-box. If you try to use your in-box as a task management system, you will fail miserably. For more on this topic, see chapter 7 in the book Total Workday Control Using Microsoft Outlook. Or see page 104 in the book Master Your Workday Now! One reason I selected ToodleDo (over many other choices) as my web and iPad/iPhone task system of choice for those that cannot use Outlook is that it’s method of converting e-mails to tasks is easy and versatile, and it works with any e-mail system. And while that method is similar to other web-based task managers like Remember the Milk, I think ToodleDo’s is much simpler. Here’s how you convert e-mails to tasks in ToodleDo (I have extracted this from my White Paper on ToodleDo). When you get an e-mail that you want to convert to a task, you merely forward the task to a specific email address that is created for your account (I’ll show you how to get that address in a moment). I put that email address in my contacts list with the name ToodleDoTasks, so all I have to do is type “Too” and the mail system auto-fills the rest. Then, retype the subject line of the forwarded email to match an action phrase. And here’s the final step; after the end of the subject line type one exclamation point for medium tasks, and type two for high priority tasks. For example “Call Ted about quarterly report ! !” will convert to a high priority task when you send it in (make sure you leave a space before the exclamation points by the way). 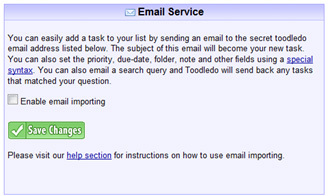 Once you click Send in your mail system, the e-mail is forwarded to ToodleDo and appears as a new task in you ToodleDo task list. The body of the e-mail becomes the body of the task (though HTML is not supported). With MYN configurations, you will see that the default date values in your task, i.e. start date = today, due date = none. And per these settings, if you do not enter an exclamation point in the subject line, the task defaults to a medium priority task. By the way, the ToodleDo servers are extremely fast—you’ll see the task appear in your task list within a few seconds after sending it. One important point. If you want ToodleDo to include attachments that were in the original e-mail as attachments in the new task, you’ll need to purchase the full ProPlus upgrade (the regular Pro upgrade does not include this). In my opinion, this is the main reason to do that upgrade, and it is well worth it (again, I make no $ off those upgrades or in any other way from ToodleDo—I just like their software). Click the Upgrade link in the lower left margin of the web application to learn more. You should note there is a glitch with the ability to convert e-mails with attached files; not all attached file types will pass into the new task. Specifically, the .msg (PC) and .eml (Mac) file types will not pass through the ToodleDo server—they are stripped off. That’s unfortunate as these are the file types of an Outlook saved e-mail. So if you use Outlook, you cannot attach a full e-mail message as a file and reply to it later—something I do a lot in the full PC-Outlook client. The ToodleDo team is working on fixing this bug. Also, as I mentioned above, HTML e-mail does not display formatted in the body of the task. The feature has been requested, but no prediction on when it will be in place. Again, this is not a full replacement for Outlook—use ToodleDo if you cannot use Outlook. Click the Enable Email Importing checkbox, and then click Save Changes, and you’ll see an e-mail address appear above the green Save Changes box—that’s your unique send-in address. Immediately copy that address into your contacts list and save it with the name ToodleDoTasks, or something similar. From now on, converting e-mails to tasks is a cinch (just use the instructions described above). If you lose the e-mail address, you can come back to the screen above; it’s always saved. That’s all for now. Have fun with ToodleDo. Something’s wrong! I seriously doubt that Michael Linenberger has a full email mailbox! Ha! Actually, we were transferring files around and it was full for about an hour. Timing is everything! Thanks Michael for your response. I sent the email today. Hi Michael, I followed your instructions to the letter and even cross-checked with ToodleDo instructions. While I did get my “secret email” address and use it to try sending email/tasks from two different email accounts, the test messages are not, in fact, showing as tasks in Toodle. Any idea what might be causing the problem? Many thanks! My resulst are the same as “New Toodle User”. I created my secret email address & sent it a couple emails from Outlook. After an hour, still no incoming items in ToddleDo. Is there a unique delay for new ToodleDo users? No unique delay that I know of. And this problem seems rare. I’d reach out to the ToodleDo folks and have them help you figure out what might be causing the problem. Is there a way to convert emails to tasks with Toodledo without forwarding them all of my mail? That is just a huge security concern for me. I use this method daily. From PC. From iPad. From cell phone. So far works every time. Make sure you are using the proper Toodledo email address. A couple of suggestions for minor updates to your posting. 1 – The setup on ToodleDo has changed. You click “TOOLS” from the top tabbed menu, then select “more” from the list. Then you will find the Email Import/Export box you describe. Thanks for catching these, we just made the changes! I have been using ToodleDo for some time and recently I also upgraded to Pro and Plus, but the attachment function seems not user friendly. It can not preview but need to download the whole file to see. Also,it cannot integrate with iPhone and iPad. Any good way to maximize the attachment function? I’m really surprised a method to forward your emails to someone else that you don’t know is a recommended thing. ToodleDo now has everyone’s emails…that’s scary! I wish there was a drag feature or Outlook 2011 for Mac actually worked better. Same applies to Dropbox and using Gmail. Never should put anything that confidential on either sites. My issue isn’t with these…it’s with business users who have a lot of tasks (which your method caters to and is great for) who probably are forwarding their mail from their Exchange mailboxes out to some Toodledo address without fully understanding the risks. I think more emphasis should be put on protecting information these days rather than just promoting functionality so we can reach more secure options…like ToodleDo or someone else building something in their app where you can convert an email to task and the data stays local. In fact…..why don’t you and your staff put together a team of devs to develop the ultimate MYN app across all platforms? 🙂 Just a thought! I’m just somewhat frustrated because I’m seeing so much more built in support for GTD and not MYN but I prefer MYN better. The mobile solutions though either just seem too security irresponsible or are too crazy to implement workarounds to make them work best. This service is not free anymore on Toodledo. You must subscribe to their Plus plan. This is frustrating.